The Resmed F10 Full Face Mask is a new full face mask series offering a more comfortable fit with easy adjustment options. This article (with video below) will detail just how quick and easy it is to work with the F10. After removing the F10 from its packaging, you will see just how light it feels and how few parts there are. Once assuring the mask is complete, it is ready to use right out of the bag. Let’s see how easy fitting the F10 mask really is. Before beginning to fit your F10, it’s a good idea to detach the F10 elbow connector from the mask by squeezing the buttons on the elbow and removing it from the mask. The smoothed portion of the elbow will insert into your CPAP tubing. Set this tubing aside until your mask is on your face. Begin fitting by setting the lower part of the face mask cushion into the crease of the chin. Do this while pulling back on the straps up and over the head, i.e. the putting on a hat motion. Once the mask is on, the top soft part of the face cushion should be resting lightly on the top of the nose bridge. Make sure the cushion is not too high or close to the eyes and not too low on the mid-portion of the chin. The cushion should be sitting just above the top of the nose bridge and the lower part of the cushion seated within the crease of the chin. Center the mask to assure the fit. Moreover, take the Velcro tabs on either side of the head strap (i.e. just above the ears on both sides of your head), pull them out and pull back just enough for a comfortable, even hold on the head. After which, take and loop the straps (i.e. below the ears) one by one to the mask. Center the mask again. Adjust your head straps for a comfortable, balanced fit above and below the ears. Then connect the elbow by squeezing the buttons (on the mask elbow) while inserting it into the mask opening. Release the buttons for a proper connection, let the tubing dangle and be arranged to your liking. Press the start button on your CPAP. You are now ready to connect to your CPAP and sleep. Lastly, if you still require assistance with this mask, please contact us. Next articleExplaining The Popularity of Resmed’s Swift FX: What’s the Big Deal? 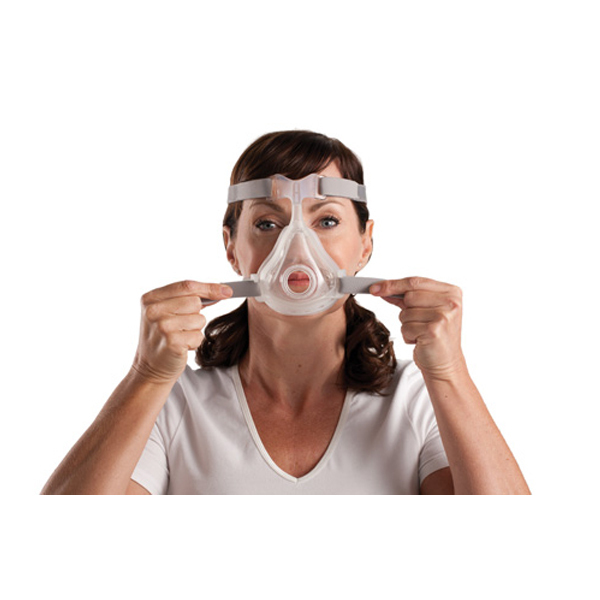 New of this CPAP user and have the AirFitF10 mask. Remarkably, the very first night I had it on for 10 hours and was able to sleep fairly well. However, the 2nd and 3rd nights were not so good. The mask feels hard and uncomfortable. This must be helpful guide to me. I’m in a week using this device. I used this mask in a resmed auto and its great. I am glad I came across your reviews they helped me to feel more comfortable about this new venture. Thank you very very much.